Computational Fluid-Structure Interaction: Methods and Applications takes the reader from the fundamentals of computational fluid and solid mechanics to the state-of-the-art in computational FSI methods, special FSI techniques, and solution of real-world problems. Leading experts in the field present the material using a unique approach that combines advanced methods, special techniques, and challenging applications. This book begins with the differential equations governing the fluid and solid mechanics, coupling conditions at the fluid–solid interface, and the basics of the finite element method. It continues with the ALE and space–time FSI methods, spatial discretization and time integration strategies for the coupled FSI equations, solution techniques for the fully-discretized coupled equations, and advanced FSI and space–time methods. It ends with special FSI techniques targeting cardiovascular FSI, parachute FSI, and wind-turbine aerodynamics and FSI. Is in full color, with diagrams illustrating the fundamental concepts and advanced methods and with insightful visualization illustrating the complexities of the problems that can be solved with the FSI methods covered in the book. 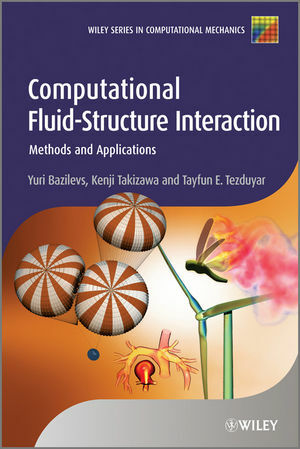 Computational Fluid-Structure Interaction: Methods and Applications is a comprehensive reference for researchers and practicing engineers who would like to advance their existing knowledge on these subjects. It is also an ideal text for graduate and senior-level undergraduate courses in computational fluid mechanics and computational FSI. Dr. Yuri Bazilevs received his PhD from University of Texas at Austin in 2006 and is an Associate Professor in Department of Structural Engineering at University of California, San Diego. He has been conducting computational fluid mechanics research since 2000, teaching classes on that subject since 2008, and has been conducting computational FSI research since 2005. He has published over 60 journal papers on computational fluid and structural mechanics and computational FSI. He coauthored a book on isogeometric analysis, a technique that is now widely used in computational fluid and structural mechanics and computational FSI. He taught short courses on these subjects. He received numerous awards for his research in computational fluid mechanics and FSI. He is an Assistant Editor of Springer journal Computational Mechanics for manuscripts on computational fluid mechanics and FSI. More information on Dr. Bazilevs can be found at ristretto.ucsd.edu/~bazily/. Dr. Kenji Takizawa received his PhD from Tokyo Institute of Technology in 2005 and is an Associate Professor in Department of Modern Mechanical Engineering and Waseda Institute for Advanced Study at Waseda University, Tokyo. He has been conducting computational fluid mechanics research since 2000, teaching classes on that subject since 2010, and has been conducting computational FSI research since 2003. He has published over 80 papers on computational fluid mechanics and FSI, including 34 journal papers. He taught short courses on these subjects. He received numerous awards for his research in computational fluid mechanics and FSI. He is an Associate Editor of ASME Journal of Applied Mechanics and is responsible for manuscripts on computational fluid mechanics and FSI. He is also an Assistant Editor of Springer journal Computational Mechanics for manuscripts on computational fluid mechanics and FSI. More information on Dr. Takizawa can be found at jp.tafsm.org/. Dr. Tayfun Tezduyar received his PhD from Caltech in 1982 and is the James F. Barbour Professor in Mechanical Engineering at Rice University, Houston. He has been conducting computational fluid mechanics research since 1979, teaching classes on that subject since 1987, and has been conducting computational FSI research since 1991. He has published over 440 papers on computational fluid mechanics and FSI, including 200 journal papers. He taught short courses on these subjects. He received numerous awards for his research in computational fluid mechanics and FSI. He is an Editor of Springer journal Computational Mechanics and is responsible for the manuscripts on computational fluid mechanics and FSI. He was the director of the Army High Performance Computing Research Center in 1994-1998, Chairman of Mechanical Engineering and Materials Science at Rice in 1999-2004, and Chairman of ASME Applied Mechanics Division in 2010-2011. More information on Dr. Tezduyar can be found at tafsm.org/tezduyar/.